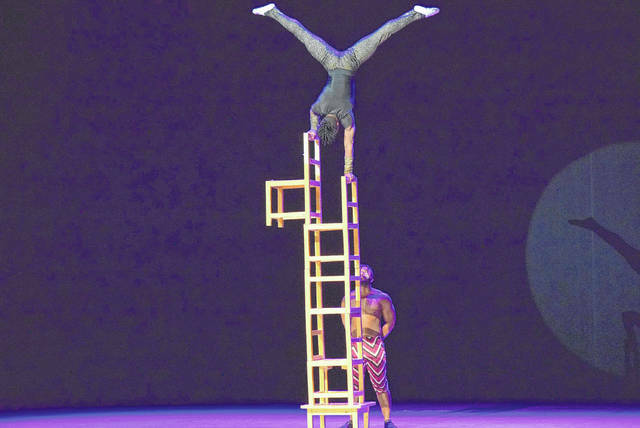 An unnamed Cirque Zuma Zuma performer shows his balancing skills. 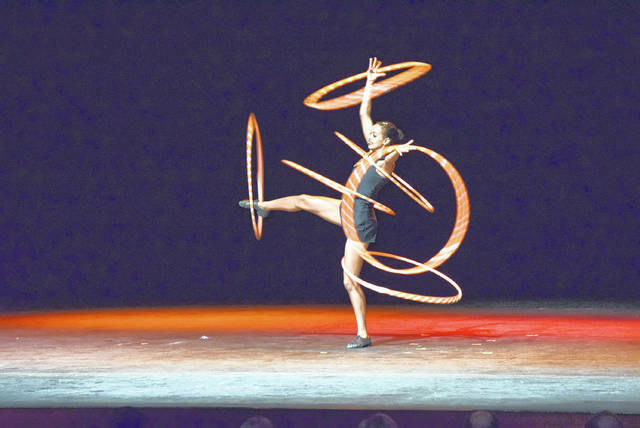 This unnamed Cirque Zuma Zuma performer demonstrates exceptional hula hoop skills. VAN WERT — Fifteen of the most amazing entertainers took the stage at the Niswonger Performing Arts Center in Van Wert Sunday. Cirque Zuma Zuma featured African drummers, acrobats, balancing acts and even a hula hoop specialist. In 2011, Zuma Zuma was a finalist in America’s Got Talent. “Yes, they’ve really took off because we’ve been having quite a lot of shows all across America, and not only America, but all over the world because we have also toured Europe and Australia,” said Eve Kawadza, spokesperson for Cirque Zuma Zuma. The group is also performing at Disney’s Animal Kingdom in Florida. “This show is a high energy program which comprises of dance, drumming, acrobatics, juggling and a whole lot more that go on, so it comprises of people from different parts of Africa. It’s not just one country we presented. For instance, on this tour, we have artists from Tanzania, Kenya, Ethiopia and Zimbabwe,” she said. The group is based in Kenya, where it has a training center to help develop the talent seen on the stage. Also at the Niswonger Performing Arts Center Sunday, before the Cirque Zuma Zuma performance, NPAC Executive Director Paul Hoverman unveiled the 2018-2019 Community Concert Series. “Under the Streetlamp,” a Jersey Boys-type show, performs September 29, while “All is Calm,” a play about the Christmas Truce of 1914, will be performed December 16. “The King’s Singers” will take the Niswonger stage on Feb. 16, 2019 and the series wraps up on March 16 with the ever popular “Texas Tenors,” as they put on a patriotic program. General subscription sales start March 12, 2018 at noon. For more information, contact the box office at 419-228-6722 or go online at www.npacvw.org. https://www.limaohio.com/wp-content/uploads/sites/54/2018/02/web1_Cirque-1-toned.jpgAn unnamed Cirque Zuma Zuma performer shows his balancing skills. https://www.limaohio.com/wp-content/uploads/sites/54/2018/02/web1_Cirque-2-toned.jpgThis unnamed Cirque Zuma Zuma performer demonstrates exceptional hula hoop skills.